I had the annual physical. I asked the right questions. At least the right ones for me. My mother had a stroke in her 50’s; my dad had many strokes and then died in his 80’s after suffering a heart attack. Dr. Oz is suggesting everyone get carotid artery ultra sounds. “ Let’s set one up” I said to my doctor. 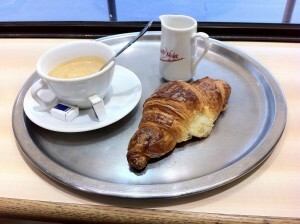 Then later in my appointment, I ended up revealing the amount of butter and sugar I eat. Daily. It’s not the sugar I’m concerned about. It’s only one little slice of cake per day. I do tend to eat too much bread and butter at times though. All my friends are on detox diets or gluten free. I’m the last man standing. Even Benjy succumbed recently and he not only doesn’t smoke (so proud of him) but now he’s a clean eater. It’s almost no fun. There’s no one left to eat forbidden foods with. Like chips. Fries dunked in mayonnaise the way I like them. Today was the 1:15 appointment to get that scan. The first call I got in the morning was my friend Andrea who had scored a croissant from the new French bakery in our hood. 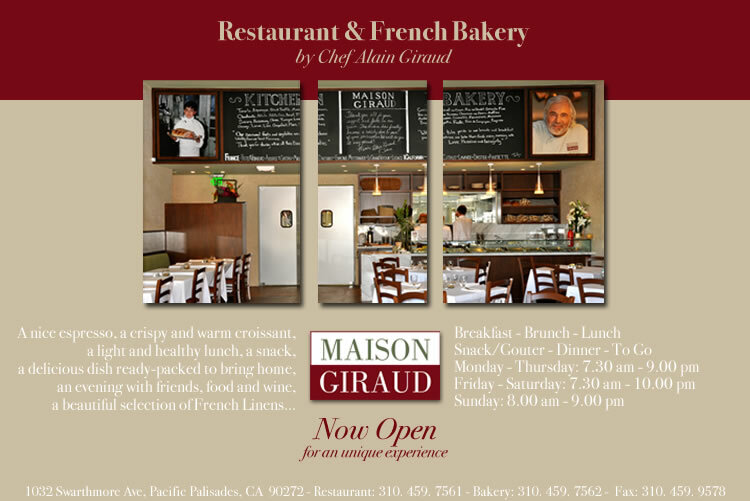 I already know I’m a fan of Alain Giraud’s croissants from his other restaurants. 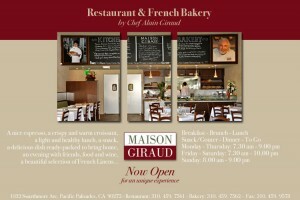 I’ve been waiting for a good restaurant to open in the Palisades for the full 20 years I have been a resident. Second call of the morning was my daughter wondering what I was doing for lunch. Perhaps I’d like to meet her at our favorite, the Beverly Hills Hotel coffee shop. I tell her, I would love to have lunch but she must meet me and go with me for this scan first. Oh, and we will be on my side of town. West of the 405 freeway. Let’s just say Santa Monica.